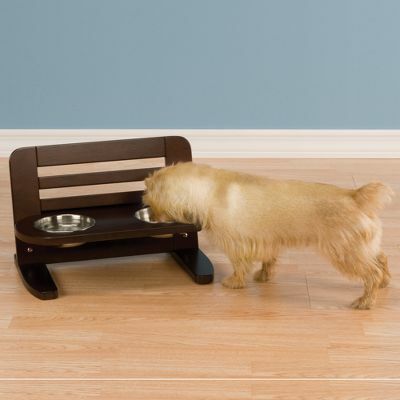 I can't tell you what a welcome sight the Perfect Position Pet Bowls are, and how long overdue... Not just because dogs come in different sizes, but because dogs differ in their abilities to reach higher or lower for their food and water. The jury is still out, I think, about whether or not a young, healthy dog should eat from bowls placed immediately below her head or on the floor. Some say that when bowls are mouth-level, they encourage dogs to eat too fast or to eat too much. If your dog eats too fast and has no disability that would affect her reach, definitely put the bowl on the floor and get your dog a Portion Pacer. Otherwise, your dog should eat and drink at a level that is natural to him. That level, as it happens, changes over time. First of all, puppies tend to grow, sometimes into big dogs. And the Perfect Position stand allows you to raise the bowls by hooking them onto a higher level perch on an attractive and sturdy wooden stand. Also, as dogs age they may develop arthritis or neurodegenerative diseases which affect the musculature in their necks. These conditions may mean that your senior dog cannot lift his head up to reach his bowl any more or, in some cases, they are unable to lower their heads to or towards the floor. Again, the Perfect Position Pet Bowls can adapt to those conditions. 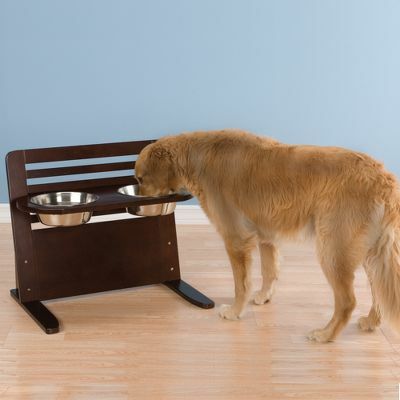 The Perfect Position Pet Bowls come with two stainless steel dish-washable bowls and, of course, the elevated stand. They come in small and large sizes and are reasonably priced for the investment you are making for your dog, as well as future dogs.